Description: This shrub is 8-20' tall, sending up multiple branching stems that form a vase-shaped crown. Stems at the base of this shrub are up to 8" across. The bark of large old stems is gray to gray-brown, somewhat rough-textured, slightly shredded, and sometimes shallowly furrowed. The bark of young stems is gray to brown and smooth, while new shoots are green and glabrous. Pairs of opposite leaves occur along the young stems and shoots. 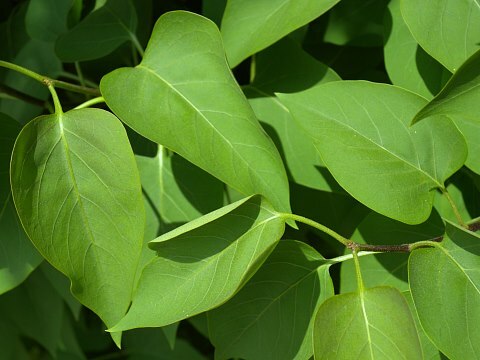 Individual leaves are 2-5" long and 1½-3½" across; they are cordate to ovate and smooth along their margins. The upper leaf surface is yellowish green to dark green and hairless, while the lower surface is pale green and hairless. The slender petioles are ½-1½" long, light green, and glabrous. Elongated panicles of flowers about 3-7" long develop from the stems of the preceding year. The panicles taper gradually toward their apices and they are ascending to erect. Individual flowers are about 1/4" (6 mm.) across and 1/3" (8 mm.) long, consisting of a narrowly tubular corolla with 4 spreading lobes, a short tubular calyx with 4 teeth, a pistil with a single style, and 2 inserted stamens. 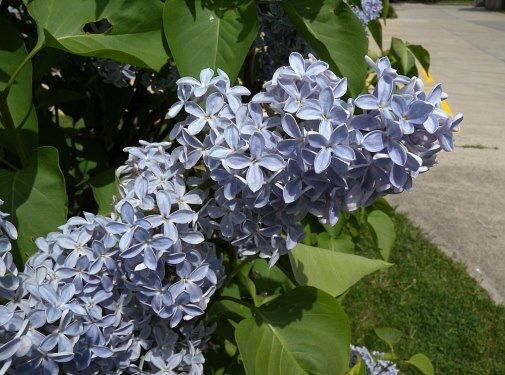 On different shrubs, the corollas can be purple, lavender, light blue, pink, or white, although lavender is the most common color. The branches of each panicle are light green and glabrous. The blooming period occurs during late spring for about 2-3 weeks. The flowers are very fragrant. Fertile flowers are replaced by ellipsoid seed capsules about ½" long; the capsules are initially green, but they become brown at maturity, dividing into 2 segments. Each capsule contains up to 4 seeds. The seeds are somewhat flattened and winged; they are distributed to some extent by the wind. The root system gradually develops clonal offsets that can form a thicket of shrubs after a sufficient length of time. The deciduous leaves become yellowish brown during the autumn. Cultivation: The preference is full or partial sun and moist to dry-mesic conditions. Different types of soil are tolerated if they are not too acidic or poorly drained. The leaves of Common Lilac are often damaged by powdery mildew, although some cultivars are highly resistant to this disease. The flowers are sometimes ruined by a late spring frost. Range & Habitat: The non-native Common Lilac has naturalized in only a few scattered counties in Illinois (see Distribution Map); it rarely escapes from cultivation. This shrub was introduced into North American from Europe as an ornamental landscape plant; it is native to SE Europe. Habitats consist of vacant lots, roadsides, thickets, and areas around abandoned dwellings, where there has been a history of disturbance. Faunal Associations: The nectar of the flowers attracts long-tongued bees, butterflies, and possibly moths. The caterpillars of several moths feed on the foliage and other others parts of Common Lilac. These species include Caloptilia syringella (Lilac Leaf-Miner), Harrisimemna trisignata (Harris' Three-Spot), Olceclostera angelica (The Angel), Podosesia syringae (Lilac Borer Moth), Callosamia promethea (Promethea Moth), Ceratomia undulosa (Waved Sphinx), Hyalophora cecropia (Cecropia Moth), Paratrea plebeja (Plebeian Sphinx), Sphinx chersis (Great Ash Sphinx), and Sphinx kalmiae (Laurel Sphinx). Among vertebrate animals, the Common Redpoll eats the buds of lilacs (DeVore et al., 2004). Photographic Location: The apartment complex of the webmaster in Urbana, Illinois. Comments: Among the different Syringa spp. 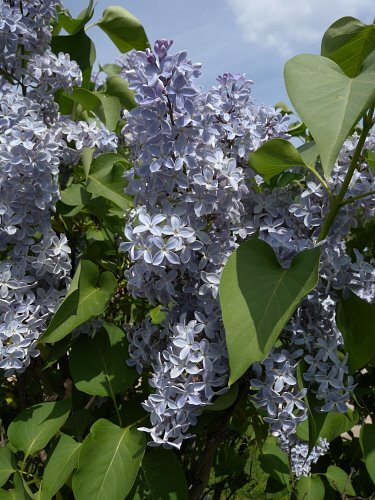 (Lilacs) that are cultivated, Common Lilac is the only species that has naturalized within the state. It does not appear to be aggressive. The fragrant flowers are very showy and distinctive. The floral oil that is responsible for this fragrance has been extracted commercially and it is used in the manufacture of scented soaps and other household items.